Panoramic views from this North-South facing patio on this extraordinary Westbrook Village home with a front veneer stone. This one-of a kind golf course beauty is loaded with custom design features, including an entertainment center, front plantation shutters, balsa wood blinds in kitchen, blackout shades in MB along with tons of little extras. Move-in ready great room plan with 3 beds & 2.5 baths. Vaulted ceiling and gorgeous manufactured wood flooring are a designers delight. Both bathrooms have been tastefully updated. Kitchen upgrades include granite counters, electric cook-top, wall oven, built-in microwave, Large covered flagstone patio and professional low-maintenance desert landscaping. New HVAC 2016, Water Heaterr 2018 Garage has been extended and features built-in cabinets. Directions: Union Hills west to Country Club Parkway. North to Village Parkway, east to Westbrook Drive, North to Behrend, East to property. Approximate size: 7431.00 sq. ft. Please, send me more information on this property: MLS# 5901394 – $465,000 – 8427 W Behrend Drive, Peoria, AZ 85382. 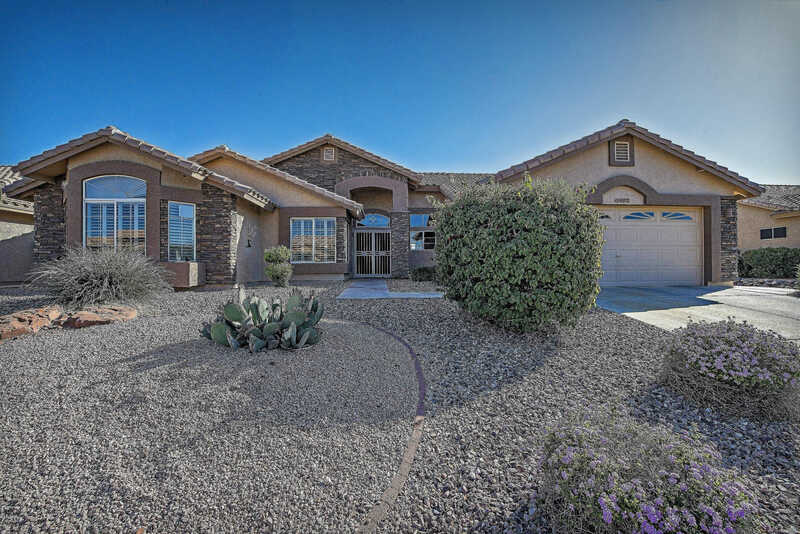 I would like to schedule a private showing for this property: MLS# 5901394 – $465,000 – 8427 W Behrend Drive, Peoria, AZ 85382.